There are lots of great brain games for dogs these days. My favorite is still the original Kong Toy. A well-packed Kong can keep a dog busy puzzling out the food for a good half hour (freeze the stuffed Kong for expert dogs). I also like Bob-a-Lots, which we sell at Rover Oaks. Just recently I picked up a Treat Wheel Dog Toy and Puzzle ($15.99 at Natural Pawz). All these toys and puzzles engage our dogs’ natural food-seeking drive. Anyone who’s faced the mess of a toppled garbage can, or seen a dog beg for food, knows that dogs will do all kinds of things for food. So, why not use food wisely to teach dogs how to do what we want them to do? (See “Food is Not a Four Letter Word” in the January / February Houston PetTalk Magazine). Brain game toys use food to exercise your dog’s mind. They are also a good way to encourage your dog’s confidence and creative thinking. Plus, it’s just darn fun to watch a dog figuring out a toy. Brain game toys range in price. Kongs start out under $10. Higher end games can reach $50-$100. That said, you don’t have to bust your budget to enjoy a good puzzle with your dog. Here’s one game you can make yourself. Place 5-10 small food treats in each of the compartments of a standard 6-count muffin pan (pictured). 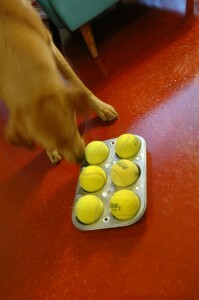 Then place a tennis ball in each of the 6 compartments so that they cover the treats. Put the pan with treats and balls on a flat surface. Some dogs may prefer a carpeted surface so that the pan doesn’t slide and make noise. Watch as your dog figures out how to remove the balls in order to get to the food. As long as your dog remains engaged with the game, sniffing and prodding, you shouldn’t have to help him. Remember, the fun of the puzzle is the process of solving it. I will be demonstrating this toy and others on FOX 26 morning news at 8 a.m. tomorrow, January 26th. 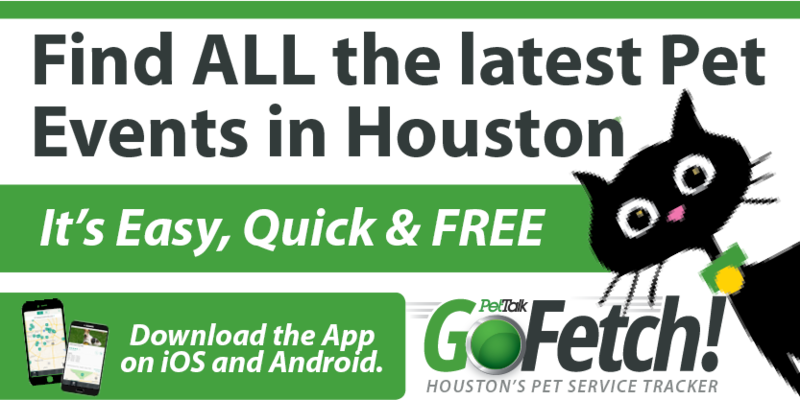 If you miss the segment live you can watch it on the Pets Section of myfoxhouston.com. Houston Dog Trainer Michael Baugh CPDT-KSA, CDBC is the director of training and behavior at Rover Oaks Pet Resort. He has a weekly dog training and behavior segment on FOX 26 Morning News and is a regular contributor to Houston PetTalk Magazine.